This pedestal table offers a variety of features that will turn your dining room into your favorite gathering place. A pedestal base and oval top makes it easy to surround the table with people and chairs, with plenty of leg room and table top space. The turned base offers a casual contemporary version of mission furniture that brings a classy design to the dining room. One 18" leaf allows you to expand or shorten the table depending on your needs. With the leaf, this dining table extends to a 62" long oval, and shortens to a 42" round table without the leaf. 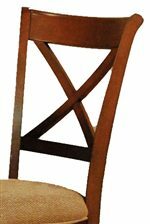 Place a few of the matching X-Back Chairs around the table for a classy Burnished Sienna dining set. The De Soto Oval Pedstal Dining Table with Leaf by AAmerica at Conlin's Furniture in the Montana, North Dakota, South Dakota, Minnesota, and Wyoming area. Product availability may vary. Contact us for the most current availability on this product. Finish 9-Step Finish Process to Achieve the Gorgeous Burnished Sienna Finish and Two-Tone Antique Black and Burnished Sienna Finish. Broad appeal, comfort, and value make the De Soto Collection pieces ideal dining furniture for any home. A 9-step finish process only begins to describe the detail gone into making this collection perfect. Pirelli webbed seating construction, soft chenille, and curved backs make the De Soto chairs comfortable, stylish, and completely necessary. A pedestal table with a sleek and stylish design makes a stunning statement in your dining room with a Burnished Sienna finish. Turn your dining room into your family's favorite gathering place with the De Soto Dining Collection. The De Soto collection is a great option if you are looking for Transitional furniture in the Montana, North Dakota, South Dakota, Minnesota, and Wyoming area.